So I've got a new bike coming, my first road bike since high school. I live in an area that is absolutely covered in goat-head thorns. They are thick everywhere, in cracks in the sidewalks, streets, and roads even. I commuted around the area on a mountain bike for years and fought the thorns. I ended up using Slime filled tubes, it's not uncommon to get hundred of thorns in each tire. I plan to start doing overnight bike camping trips and exploring the surrounding countryside. What should I do for my road bike. It has Vittoria Zaffiro 700x25 tires. all the changes in armoring your replacement choices of tires against thorns will make them heavier..
puncture resistant tires also add weight , with the added barrier material under the tread rubber..
there is a subforum of others in the region where that flora grows..
Last edited by fietsbob; 04-15-19 at 10:10 AM. 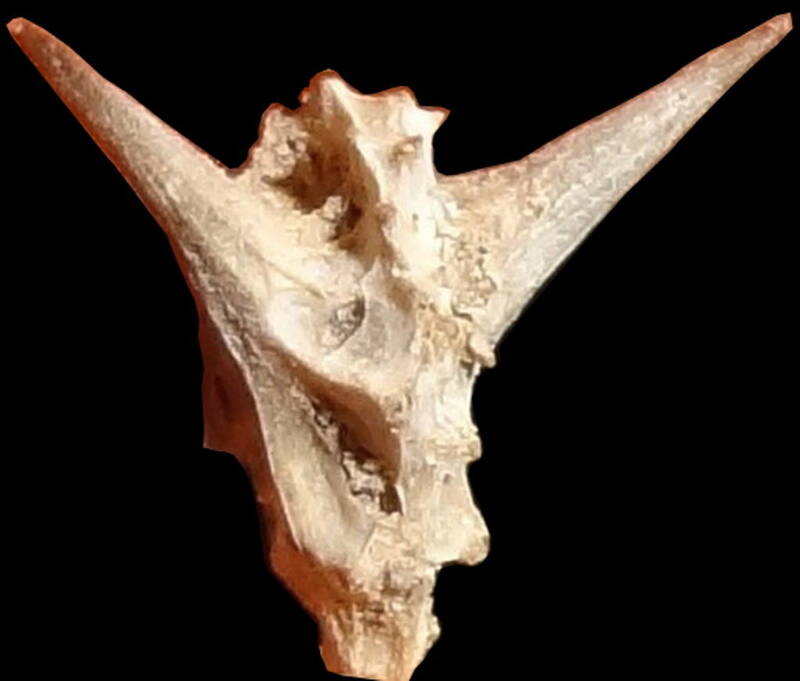 If you live in goat head thorn areas, you are already familiar with much of the drill. 1. As much as possible, I hang out on the major roads. That short-cut sidewalk or trail might seem tempting, but it might also have a lot of new thorns. 2. When I go to my campsite, I will often carry my bike rather than wheeling it. If I stop along the way to go to the bathroom, I might also be careful in how I transport the bike. 3. Before getting back on the road (I will have carried the bike), I'll also carefully check each tire making sure no goatheads have attached themselves. 4. When using a thermarest or similar inflatable mattress, check twice under the tent site to clear out thorns. Consider using a ground sheet. Might not stop them completely, but probably also helps. I do end up with more thorn-resistant tires like Schwalbe Marathon Plus. At least when new, these can definitely help - though they also aren't 100%. Thanks. I read the Zaffiro is actually a fairly tough tire, but I wondered if swapping to something like the Marathons would be better. Hate to start swapping stuff before it wears out, but I'm having multiple flat tire neurosis. Goat Heads come up quite regularly. Heavy duty tire. These are thick, and have an extra layer designed more to absorb thorns and etc than actually provide protection. (Schwalbe Marathon Plus, Michelin Protek Max & Protek Cross Max, Panaracer Tourguard, etc). The Marathon Plus comes in a narrow 700x25 size. Tire Liners. There are quite a few out there. Some have suggested the Panaracer Flataway which is a lightweight woven fabric. I've got my nephew trying a pair now. I don't have goatheads here. Tire Wipers. An "old school" approach. Generally fallen out of favor, but they may well pick off the goat heads before they dig deep into the tires. Sealants. A few different types. The slime is more or less to plug hoes. It lasts forever. The Latex sealants do more of a gluing of the holes for a more permanent repair, but also require periodic refilling & maintenance. As an extension to sealants, tubeless tires are designed to work with the sealants, and, again, plug the holes when they occur. They have been used with MTBs for quite sometime, but rapidly evolving for road use. There has been a lot of buzz about the Pirelli Cinturato Velo TLR tire being tough, but not a lot of long-term reviews on it yet. Hopefully I'll try it out this spring/summer. I was somewhat disappointed by my Schwalbe Pro One test. You may end up combining a couple of methods for best results. Paradoxically enough, I have found that using latex inner tubes makes it less likely for my tires to get punctured as a result of an encounter with goatheads. Where I live, they are all over the place. It may also be a good idea to avoid the edge of the road, especially out on open rural roads. 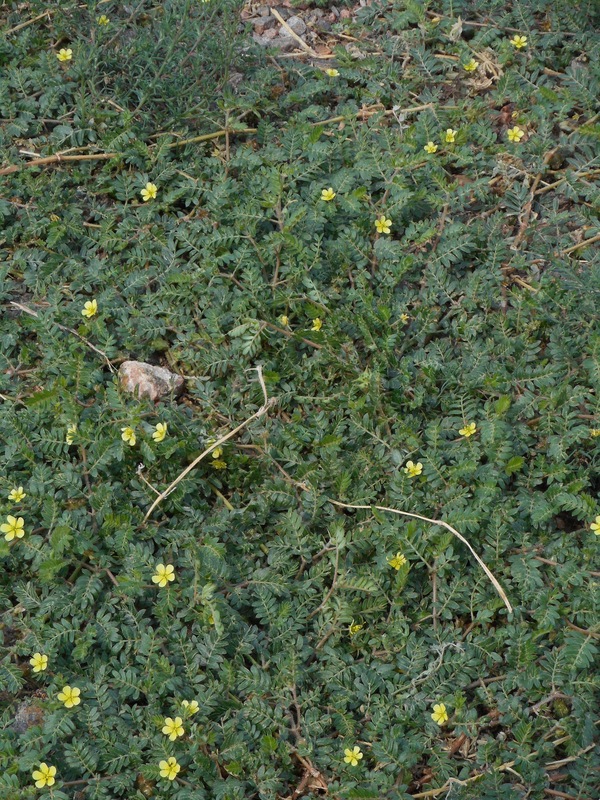 An individual tribulus terrestris plant spreads very wide and seldom grows more that 3/4" off the ground. It has small green leaves and yellow flowers. Each flower results in 5 seed pods and there can be thousands of flowers per plant. Wikipedia says that they can grow up to 6' in diameter but I've seen them in southern Colorado that are at least 6' in radius. It grows well in disturbed soils but does not compete with other plants well. 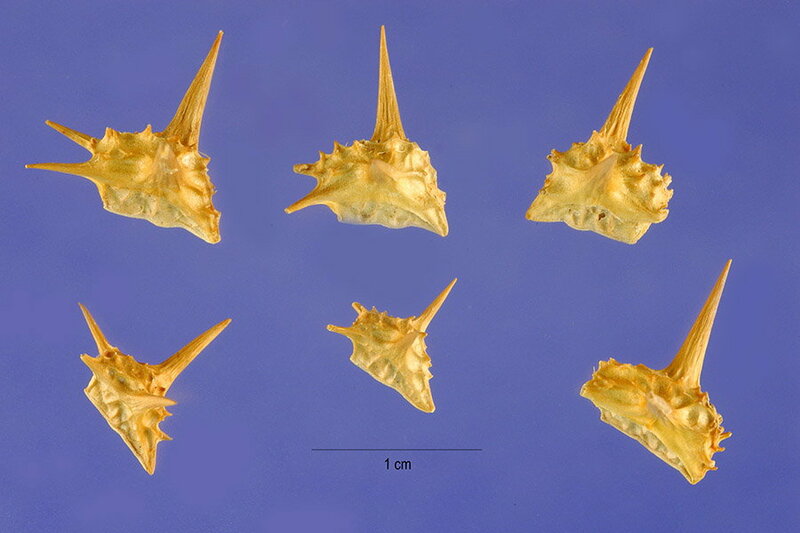 Once grasses or other plants move into the area, the tribulus terrestris dies out and the seeds will lay fallow. The seeds can lay fallow for up to 50 years and still germinate. Since we humans like to disturb soils so much, it's a match made in heaven. The following picture shows how poorly they compete with grasses. The large patch of goat heads is on the right side of the fence in a vehicle parking lot. There are no goathead plants growing in the grass. Given what you've said above, I think part of your problem is that you don't recognize the plant and ride over it. You might also be riding in disturbed areas like new bike paths. Be aware that nothing is perfect...including tubeless. I've been on rides with people who have flatted tubeless tires on goatheads. Slime isn't perfect. Liners aren't perfect. "Thorn proof" tubes aren't and are, perhaps, the most useless of all the solutions. I use liners to good effect but they can still flat. I've used Slime and didn't find it was any better. Don't tempt the goat head god either. It is a capricious and vengeful god! On the ride where the tubeless flatted, I managed to do the ride without a single flat. There were 4 people on the ride and we had 27 flats between the 4 of us. One poor woman had 20, the guy with the tubeless had 6 and my wife had 1 (I forgot to put a liner back in one of her tires). I crowed about how wonderful my liners were. The next time I went to the same area, I stopped counting at 65 punctures...on one tire. The other one had a similar number. The moral of the story is to be humble before the god of goat heads. Epilogue: The next time I went to the same area (it a regular ride I take people on, see Wandering in Purgatory below), I decided to not take chances. I got used tires that I was just going to throw away after the ride, I put in liners and Slime tubes. The wheels weighed a ton! I did the entire ride with my daughter (similarly equipped) and we had zero flats between us. We picked up zero goat heads. I fear what the goat head god has in store for me next time I go down there! Hate to start swapping stuff before it wears out, but I'm having multiple flat tire neurosis. You can always start with the tires you have and swap only if you start having a lot of issues. One tire related data point, not just goat heads. In 2013, myself and ~50 others bicycled across Africa with TDA. Parts of Africa have a lot of thorns. On completion, we compared the number of flat tires. I had two in four months which was lower than average, though not the lowest (two people had no flats). There were at least two people who had close to *10* flats on the first day we went off-road in Sudan. Not a 100% correlation, but Marathon Plus definitely did better in that environment than the average tire. On the other hand, I was also one of the slowest cyclists . I chalk that up more to being a slower cyclists than my tires though. Thanks for the info guys, I definitely appreciate it. I for sure know what the plant looks like, I can recognize those little yellow flowers a block away. I spend an inordinate amount of time digging them out of my yard. The seeds (nutlets, the thorny part) dry and turn rock hard, and spread everywhere. They are spread by animals, shoes, and even the wind. Then they take hold and continue to spread. They are so thick in the valley in south central Nebraska where I live, that the dry thorns are on every sidewalk, path, street, even when the plant is not near. You can avoid the plant, but not the thorns. I've commuted around here on a mountain bike for years, never going anywhere with speed or efficiency in mind. The big heavy tread tires with slime filled tubes were the only way I found to avoid flats. The skinny tire road bike is new to me, and I just wondered if any new technologies work better for the thorns. If you think it's bad in your tire try one in your heel. For skinny road tires, I would recommend the thickest tread you can find, something 5 mm or so thick or thicker. 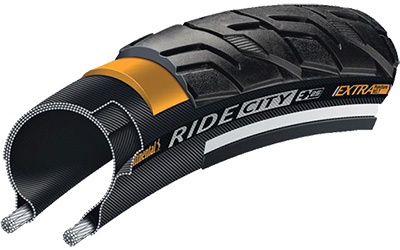 Some tires have a liner built in like the Schwalbe Marathons, and also some of the Continental urban tires, I have some City Rides in 32 that are nice and thick (and heavy). I gladly deal with a little extra weight if it means no goathead flats. 100% FLAT FREE by design. Interesting, it looks like Tannus has come out with a new tire liner (but only for 35 to 47mm tires, depending on the model, I think). True that brother. Major OUCH time. Worse than stepping on a Lego brick in the middle of the night. Back when I used cheap tires, I used Mr Tuffy liners. They work okay too, but after a year or so the liners themselves would eventually wear holes in the tubes. I have had my Touring bicycle since early 2014. I am on a third set of tires and only one flat. The first month I had it I had a slow leak. The shop I purchased it from had put the tires I requested on but had kept the crap tubes. I had 2x 26" Schwalbe Marathon Supreme tires and tubes that were to thin when inflated.They wouldn't take a patch. I purchased Conti 26 Freeride tubes that say 26x2.3 to 26x2.7 and they work great. No more internal flats. I live in the high dessert and so far the only goat heads are the ones I pull out of our dogs paws. I live in the goat head and bottle glass capital of the world. The answer is tubeless. I haven't gotten a puncture flat on tubeless in around 30,000 miles. I will routinely pull 2-3 thorn tips out of my tires after every ride. I grew up in the capital of goat heads. I never did go without shoes. Still have sensitive feet because of it. 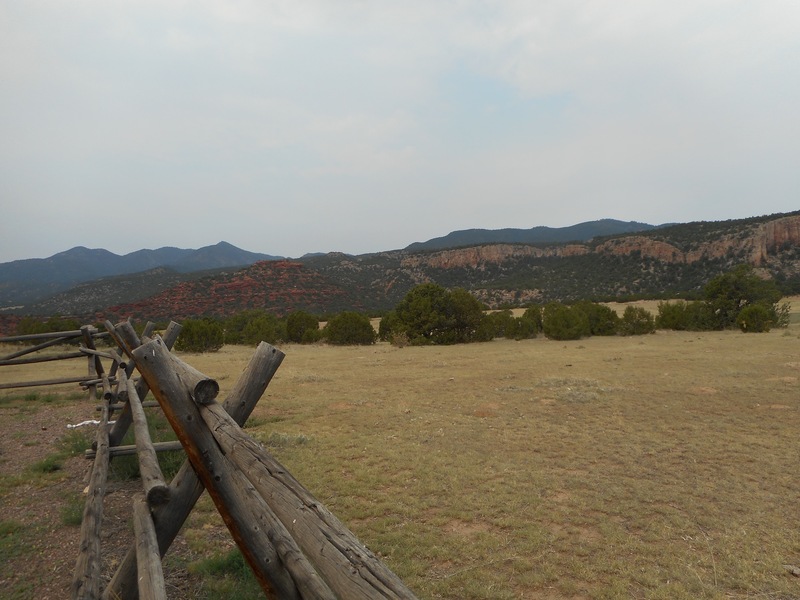 Epilogue: The next time I went to the same area (it a regular ride I take people on, ! Listen, and understand! The goatheads are out there! They can't be bargained with. They can't be reasoned with. They don't feel pity, or remorse, or fear. And They absolutely will not stop... ever, until you have flatted! 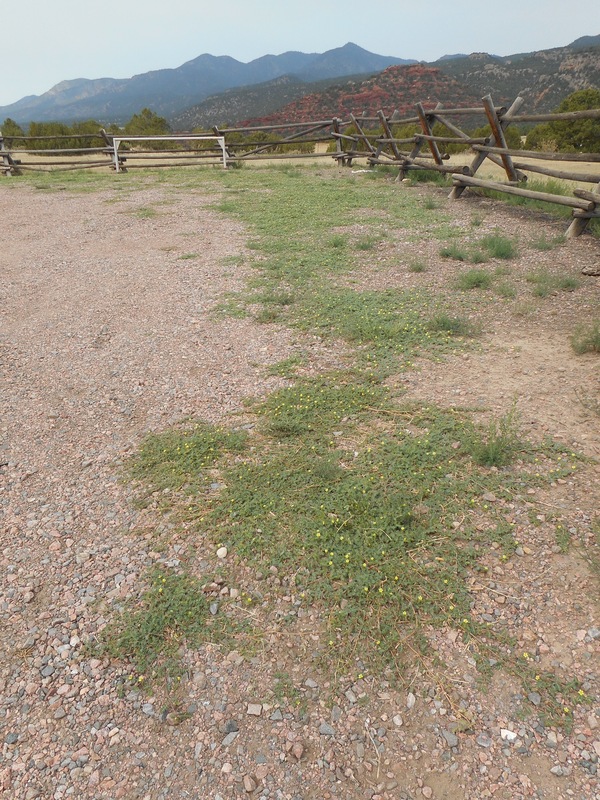 So what's worse, goat heads or star thistle? Has anyone tried tire-savers on their tires? If not, why not? They wouldn't stop all goathead flats but done right, should get most of the goatheads that didn't penetrate fully the first time. You can make your own with 14 or 15 gauge spokes and that tubing sized to be a tight fit. I'd rather have 15 gauge but the tubing and a nice fit would decide it for me. I just run tires on my road bike that are so fat they barely clear the brake calipers. These are my cheap man's tire wipers.